It is always pleasant to read papers published by friends and old colleagues. Also it was about time I would write another post about Leishmania. This new paper published in Cell host and microbe (pubmed index) discusses a new mechanism that Leishmania parasites use to evade the host immunity. A quick reminder, the promastigote forms of Leishmania enter the mammalian host via bite of the sandfly. They are readily phagocytosed by macrophages. Yet, they manage to evade to propagate within the macrophage thanks to multiple mechanisms of immune modulation and evasion. Previous publications of this group that showed how Leishmania is able to impair maturation of the phagolysosome (for example delay acidification) by interfering with phagolysosome associated proteins. Their previous work had pointed to Leishmania‘s surface lipophosphoglycan LPG. Following their work on the phagosome, they look to see if there are other molecules that are also altered after Leishmania infection, stumbling upon VAMP3 and VAMP8, two SNAREs that are cleaved after infection. They find that this time this time this cleavage is due to another important virulence factor of Leishmania namely surface protease GP63. This protease has been shown to have many immunomodulatory properties and cleaving many important macrophage proteins (phosphatases, transcription factors…) and now there is a new one on the list. The authors show that VAMP8 is important for cross-presentation of antigens from MHCII to MHCI. To show this they create ovalbumin expressing expressing L. major and see how presence or absence of GP63 could affect activation of OT-II (ovalbumin-reactive T cells) after coculture with macrophages. Importance of VAMP8 in cross presentation is also shown by using VAMP8-/- cells. SNAREs are important in vesicle transport and fusion. Therefore they can be targeted by pathogens like Leishmania to impair effective pathogen killing (Image from Wikipedia). What is nice about this study is that by studying host-parasite interactions and immune modulation, it also helps us learn more about the innate immune mechanisms and communication of the innate and adaptive immune systems. Trichuris, is an intestinal roundworm, also known as whipworm, that can be transmitted through ingestion of food contaminated with its eggs. The larvae hatch inside the small intestine and complete their life cycle to adults in the cecum. After maturation, which can take about 3 months, the female worm lays thousands of eggs per day. The parasite can stay in the intetine between 1-5 years. Trichuris trichiura is a parasite of humans, while Trichuris muris is a mouse parasite, used usually as the animal model to study its infection. In contrast to intracellular pathogens, a Th1 response is non-protective in infection with large extracellular pathogens such as intestinal helminths. For instance, during infection with Trichuris muris, a Th2 response comprising IL-4 and Ig-E production leads to resolution of infection, while a Th1 response comprising IFN-gamma, IL-12 and IL-18 is not protective. S Hadidi et al. look at regulation of the immune response to T. muris and focus on the importance of the macrophage lipid phosphatase Ship1. Ship1 or Sh-2 containing inositol 5′ phosphatase 1 is a regulator of the PI3K pathway. Hadidi et al. show that Ship1 expression is upregulated steadily following T. muris infection. Ship1-/- mice have higher parasite burden and IFN-gamma while lower levels of IL-13. Also, Ship1-/- macrophages produce more IL-12. Blocking IL-12 or IFN-gamma by blocking antibodies rescued the phenotype by reducing worm burden and increase in IL-13. Thus, they found how activity of this phosphatase can direct the immune response against T. muris infection. It would be very interesting now to see what stimuli induce upregulation of Ship1 and also what are this enzyme’s substrates, which are so important for production of IL-12 by macrophages. Similar to this story, a few years ago, Abu-Dayyeh et al. and Gomez et al. showed that activating phosphatases is important for Leishmania to establish its infection. Being an intracellular parasite, a Th1 response, with large amounts of IFN-gamma would be protective against Leishmania. So in this context, Leishmania-mediated activation of many phosphatases (most importantly SHP-1) leading to inhibition of IL-12 production leads to disease progression, because it skews the immune response towards Th2. In this situation, Leishmania takes advantage of the phosphatase’s function. It has been documented that HIV infection can render leishmaniasis harsher and reduce the chances of treatment response. On the other hand, Leishmania infection also accelerates HIV infection and disease progression. In this blog post, we summarize a recent article published in PLoS Pathogens, that explores the mechanism through which Leishmania can help HIV replication. As it turns out, human macrophages are a key part of the equation. It is no secret that both HIV and Leishmania can infect macrophages. So when Mock et al. wanted to examine the relationship between these two microorganisms, macrophages were the first place they looked. Macrophages are non-dividing cells with a low nucleotide pool. Nucleotide synthesis is regulated at the S phase, in other words, cell activation. So in resting macrophages the nucleotide levels are very low. Additionally, It was previously thought that human monocytes do not further proliferate once they leave the bone marrow. Recent studies however, have shown that monocytes may be far more heterogeneous than previously thought, and that a subset of them can go on to enter the cell cycle in response to certain stimulations. For example, cells stimulated with GM-CSF (Granulocyte-monocyte colony-stimulating factor) were shown to go on to proliferate. Interestingly, Mock et al. showed that Leishmania infection can promote monocyte viability and proliferation similar to GM-CSF. It has long been seen that intracellular protozoan parasites such as Leishmania, Trypanosoma and Toxoplasma can inhibit apoptosis of their host cell and thereby increase their lifespan (Heussler et al. 2001). Mock et al. take this to the next step showing that Leishmania­ might further induce proliferation of the infected monocytes. This could help spreading of the parasitic infection, and indeed Mock et al. show that the cells remain infected after proliferation (Figure 1, PKH dye shows that monocytes are infected with Leishmania). However, if this is good or bad for Leishmania, still needs to be determined, especially that an activated macrophage could be able to kill internalized parasites. Another theory as to why Leishmania promotes cell cycle progression in macrophages is the following: Leishmania parasites lack the machinery necessary for synthesizing purine nucleotides. Resting cells have low levels of nucleotides. Therefore, by activating the cell cycle, Leishmania ensures that sufficient levels of nucleotides become available for its replication. In fact Mock et al. examined the effect of macrophage infection by Leishmania on expression levels of ribonucleotide reductase (RNR) enzyme. This enzyme is responsible for converting ribonucleotides to nucleotides. Western blotting revealed that RNR levels increased in the presence of Leishmania infection, similar to those elevated levels seen in the presence of GM-CSF. This elevation also corresponded with nucleotide level increases. Overall, this presents one theory for why Leishmania would want to induce macrophage stimulation. As mentioned earlier, macrophages are also a target for HIV infection. But HIV replicates at a very high rate. And high rate of replication requires high levels of intracellular nucleotides. In fact, the Kim group have previously shown that HIV reverse transcription is severely reduced under conditions which mimic macrophage intracellular levels of nucleotides and that HIV replication is lower in macrophages as compared to T cells (Kennedy et al. 2010) . 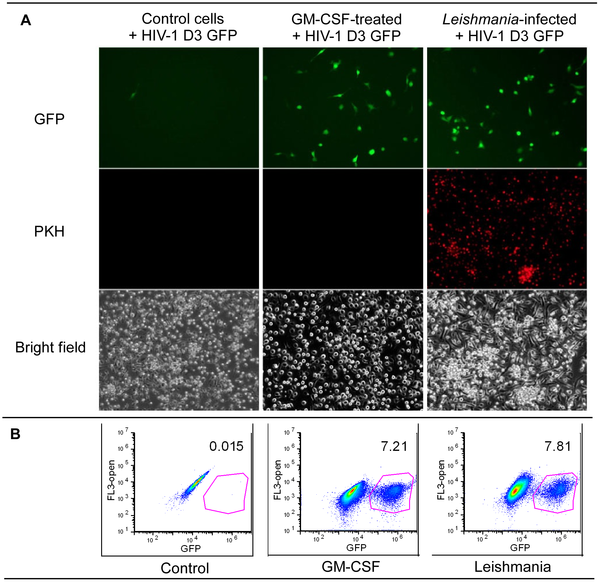 Based on their observations with Leishmania and HIV, they showed that HIV replication in macrophages may increase when the cells are co-infected with the parasite (Figure 1, Green GFP-HIV proliferation only occurs in GM-CSF-treated or Leishmania-infected monocytes). They also showed that this is the result of Leishmania-induced cell proliferation and increased nucleotide levels (figure not shown). In other words, Leishmania manipulates the macrophage to create a friendlier environment for its own survival and HIV ceases this opportunity and uses these changes in the macrophage for its own gain. It is likely that there are many different mechanisms involved in Leishmania/HIV co-infection that were not discussed here. Almost certainly many of them involve immune modulation. Here, Mock et al. have shed light on a unique biochemical mechanism for the observed increased infection by either microorganism. As suggested by the authors, it would be interesting to examine other macrophage-infecting microorganisms such as Mycobacterium tuberculosis in this context. This topic raises many exciting questions. Most fundamentally, what is the underlying mechanism for induction of proliferation in Leishmania-infected monocytes? And what is the implication of monocyte proliferation to spread or control of Leishmania infection? But also, what happens to HIV in macrophages in the absence of a parasitic infection? These could perhaps be the topics of next research projects and next blog posts. One of the complexities in studying eukaryotic parasites is the multiplicity of their life stages. Even the simplest life cycles of eukaryotic parasites can consist of two very different stages, with different morphologies, gene expression, proteome profiles, and surface antigens. These variations often result in confusion of the immune system and disease progression instead of healing. What makes this more complicated is that very often one or more of these stages, usually the one inside the mammalian host can be difficult to culture and study in vitro. For instance, in the case of Leishmania parasites, the clinically important amastigote stage is intracellular. Methods for their axenic growth do exist; still their validity and authenticity remains controversial among researchers. Nevertheless, I believe authentic or not, axenic Leishmania amastigotes can be good tools for studying this aloof life stage of the parasite. As the famous statistician George P.E. Box says ‘Essentially, all models are wrong, but some of them are useful’. Yet another complexity of working with these ancient species is presence of a great percentage of what genome annotators call ‘Hypothetical proteins’. These proteins appear after bioinformatic analyses of the genome sequences in search for genes. There is no other evidence rather than clues from the sequence for their existence, so they are labeled hypothetical. In addition, in many cases they have no homology to any protein with a known function, thus their function remains a big question mark, which brings me to the two papers I want to discuss! These papers both came out last year and used immunoproteomics to hunt for new diagnostic and vaccine targets for leishmaniasis. Vinicio T. S. Coelho et al. ran 2D gels of promastigote and axenic amastigotes of Leishmania chagasi, a visceral leishmaniasis-causing species in Latin America, and blotted them against pooled sera of infected, uninfected or nonsympomatic dogs. Míriam M. Costa et al. used the colourful 2D-Difference Gel Electrophoresis (DIGE) method to look at differentially expressed proteins between promastigotes and amastigotes and also blotted them against pooled sera of uninfected, 30 day infected and chronically infected dogs to compare levels of early and late (IgM and IgG) antibodies. Both studies aimed to find immunogenic proteins as candidates for diagnosis and vaccination. For those who are not familiar with the ecology of Leishmania, I should mention that leishmaniasis is a zoonosis, and dogs are an important reservoir of the parasite that keep the cycle going, even if we prevent it in humans. Thus, vaccination of dogs against both cutaneous and visceral leishmaniasis is among the important priorities for disease control. The importance of these two studies is the application of both promastigote and amastigote proteins as sources for antigen discovery, as well as the use of sera from asymptomatic versus symptomatic dogs to characterize antibodies that arise at different stages of infection. This allows for identification of proper markers for early and advanced stages of the disease as well as knowledge about expression and antigenicity of proteins from each life stage of the parasite. Not surprisingly, in both studies, a decent number of hypothetical proteins show up. On one hand, these are not the best candidates one may look for, since we have no knowledge about their expression, function and so on. But on the other hand, I would see them as potentially interesting targets that could be worth studying. At least, we are narrowing down all the hypothetical proteins to ones for which we have data on expression and antigenicity. In addition, the results of these studies and other studies of the similar nature should be cross-referenced in the public gene and protein databases, so that other researchers can readily access the new knowledge that has become available about these hypothetical proteins when looking them up. Once these sorts of data from various stydies start to accumulate in the databases, new patterns and insights might emerge that can lead us to an understanding of their function and possible roles in pathogenicity. I will hereby post the author summary of my most recent publication regarding modulation of macrophage signaling by the Leishmania parasite. The paper has been published on the 23rd of December 2008 in the Public Library of Science (PLoS) Neglected Tropical Diseases, and demonstrates for the first time the ability of Leishmania to inactivate IRAK-1 through its ability to activate host PTP-SHP-1. Leishmania developed several methods to seize control of macrophage signalling pathways in an effort to inactivate their killing abilities. One effective method utilized by the parasite is the activation of host protein tyrosine phosphatases, specifically SHP-1. This increased phosphatase activity contributes to the inactivation of signalling molecules involved in critical macrophage functions such as NO and cytokine production. Interestingly, the absence of SHP-1 results in stronger macrophage inflammatory responses to a bacterial cell wall component known as LPS, a molecule detected by macrophages through Toll-like receptors (TLRs). This observation suggested a role for SHP-1 in the regulation of TLR signalling. Our study reveals that upon Leishmania infection, SHP-1 is able to rapidly bind to and inactivate a critical kinase (IRAK-1) in this pathway. This regulatory binding was shown to be mediated by an evolutionarily conserved motif identified in the kinase. This motif was also present in other kinases involved in Toll signalling and therefore could represent a regulatory mechanism of relevance to many kinases. This work not only reports a unique mechanism by which Leishmania can avoid harmful TLR signalling, but also provides a platform on which extensive investigation on host evasion mechanisms and regulation of cellular kinases can be gained. For further information please check the citation below to read the whole paper. PLoS is an open-access journal and therefore offers free access to its contents to anybody anywhere in the world! P.S. : Abstract translations are also available in the following languages: Arabic, French, Spanish, and Farsi. The differentiation of the promastigote Leishmania to the amastigote form is one of the most interesting and promising areas of study in Leishmania research. Researchers are interested to know what are the differences between these two life-stages, how do the parasites shift from one to the other and what happens during this transformation. Rosenzweig et al. have addressed these questions by proteomic comparison of Leishmania donovani’s proteome during its transformation from the promastigote to the amastigote form. Using a new labelling method called the iTRAQ, they have looked at the proteome of L. donovani after stimulation with low pH and high temperature within 2.5, 5, 10, 15, 24h and after 6 days. With their method they believe that they have been able to detect half of the parasite’s proteome. This study has shown key changes in the proteome content of L. donovani which corresponds with its metabolic needs in the phagolysosome. The mid-gut of sandfly is a sugar-rich environment because of its nectar-diet supplemented with occasional bloodmeals. However, sugars are scarce in the phagolysosome and the parasite has to switch to fatty acids and amino acids as energy sources. According to Rosenzweig et al., starting from 10h after stimulation, glycolysis enzymes are down-regulated while enzymes required for beta-oxidation, gluconeogenesis, amino acid catabolism, TCA cycle and mitochondrial respiration are up-regulated. Furthermore, protein translation and thus metabolism slows down which corresponds to parasite’s smaller size and slower growth. In this way the parasite retools its metabolism to be able to live and multiply inside the phagolysosome. Another interesting and rather surprising finding of Rosenzweig et al. is that most of these alterations in metabolism start rather late (after 10-15h) and they take hours to maturate. This finding, raises the question that how do incompletely differentiated parasites reside in the same host environment as the mature amastigotes? A very interesting conceptual model for parasitic virulence was proposed by Chang et al. (2003) a few years ago and has been recently discussed in Leishmania and Leishmaniasis by Banuls et al. (2007). It has long been established that parasitic organisms, bacteria, protozoa, helminths etc. benefit from certain molecules that enable them establish infection within the host and cause pathogenicity. It can be said that the parasites are at the same time ‘visible’ and ‘invisible’ to the host. Here I briefly introduce the model with Leishmania as the model organism. The idea is to define twp groups of effective molecules named invasive/evasive and pathoantigenic. The invasive/evasive molecules help the parasite to evade from the innate immune system and its microbicidal mechanisms to establish its infection. These molecules usually stay ‘invisible’ to the immune system and their expression might end after the establishment of infection. Good examples in the case for Leishmania are gp63 surface protease and the surface molecule lypophosphoglycan (LPG). 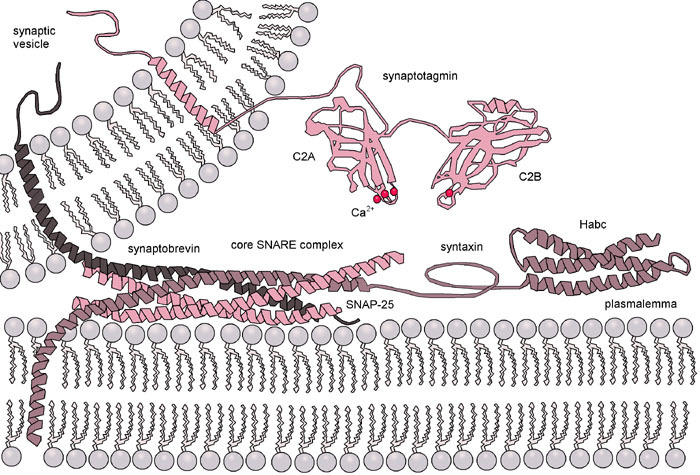 Both of these molecules have crucial roles in evasion from the complement system, facilitation of phagocytosis and subversion of macrophage signalling to the parasite’s benefit. Their expression is slowed down and LPG is almost totally absent in Leishmania amastigotes. As expected, they also do not elicit an immune response. On the other hand, another rank of molecules, which are generally intracellular in Leishmania are pathoantigenic and cause immunopathologic responses. Interestingly, the majority of Leishmania’s immunogenic proteins are intracellular rather surface proteins and are being produced as a result of parasite’s multiplication within the host. They are believed to be exposed to the immune system during cytolysis and cause the virulence phenotype. A proper example is the amastigote-specific protein A2 which is an intracellular protein and is highly immunogenic. This protein being expressed in high levels in visceral species induces visceralization of Leishmaniasis. Chang et al. have discussed their model extensively with Leishmania infection but have described how it could beautifully fit with other types of acute and chronic diseases. For instance in schistosomiasis, the adult worm stays in the blood vessel ‘invisible’ to the immune system while releaseing highly antigenic eggs that cause immunopathology. This model can present convergent evolution of parasitic strategies in very divergent parasites. Perhaps each parasitologist could at least conceptually fit and expand this model for their own parasite of interest to have a better overall understanding of its parasitic strategies.